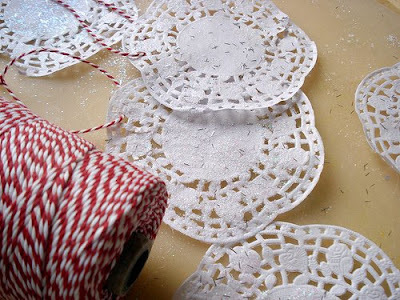 Put the doilies out on something that they won't dry onto. I used a plastic cutting board. I bet waxed paper would work too. 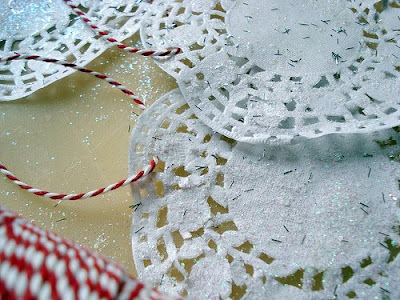 Brush the doilies with Mod Podge - a thin layer is best, but not really possible with kids. Sprinkle with glitter. Let dry. Don't pick them up until they are all dry - they rip very easily when they're wet. See the picture of ours. After they've dried (usually over night in a warm spot) repeat on the flip side (or not.) Dry and then add ribbon for hangers. See? Simple and pretty. Best part is you can keep them up for January. Very pretty! You come up with the best stuff! Great idea! I'm putting this on my list of things to do with my little boys while school is out for Christmas. We need super simple crafts around here and this is perfect! I stumbled on your blog from One Pretty Thing. In one of your earlier posts, you have mentioned Kilo - that is a kilogram (kg). It is a unit of measurement of mass and approximately 1Kg = 2 pounds. My work needs me to travel and live in different parts of the world and I love it. So far I have the opportunity to live in Belgium, UK and US apart from India(my home country). It is wonderful to learn the different cultures! Very pretty! I have a package of lonely doilies begging to be used. Thanks for the inspiration. Question--where did you get your spool of baker's twine? I'd love to get some. It's just so perfect for Christmas!